Dr. Hugo Z. Hackenbush discovers that thanks to anti-trust exemptions, his NJ hospital can charge $99K for a COPD patient who would have to pay only $7K for the same treatment across the river in the Bronx. from Day at the Races. I’ve written here about my dad and alluded to some of his pet peeves. Dad was something of a moocher in life, and when he had to pay for things, he got… intense. And one of the things that made him crazy was price gouging. He had a point–if you go to a ball game and you want a beer, it’s not like you have a choice of vendors. You’re going to buy a beer at the stadium and pay a huge premium for it. Ditto for the Coke and the popcorn at the movie house. In his way of thinking, if you paid your ticket price, you were supporting the core business. If the pizza joint two doors down from the Cineplex could make a profit on selling a soft drink for $1.75, why did the theater get $3.00 for the same thing? (Dad also had a thing about tipping–in his judgment, it wasn’t his job to pay the staff at the restaurant. If the owner wanted to charge enough to pay his staff, that was one thing, but waiters shouldn’t expect the kindness of strangers. He was a fun guy to go out with). Dad never had a phrase for this sort of behavior, but I do. I call it ‘hostage capitalism‘. It’s the dark side of the Randian world that libertarians won’t own up to. If your car breaks down in a strange place, you are a hostage to the mechanic who shows up. If you’re in the city and you can’t get Direct TV owing to all the buildings in the way, you’re a hostage to the cable company. In my neighborhood, there’s one supermarket within walking distance and it’s making the health inspectors very wealthy–they surely have vermin problems, their ice-cream always has freezer burn and they leave packaged food on the shelves long after the expiration date. But if your grocery buying involves a granny cart, you’re pretty much stuck–the next closest supermarket is over a mile away. I’ve been thinking about this for awhile. 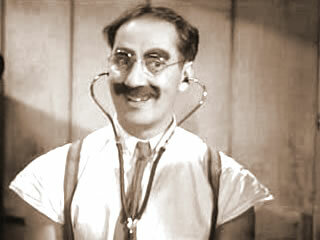 I’m a hapless ‘consumer’ of medical care owing to bad luck (two broken tibias, thank you) and the usual ravages of age. And medical care is is exhibit A of hostage capitalism–whether you’re brought to an ER not of your choosing or your GP sends you to the hospital he has admitting rights to, you have absolutely no control over costs or reimbursement. If your insurance company throws you under the bus, it’s all on you–the five-dollar Advil, the $1500 dollar MRI, the box of Kleenex for $10. And this doesn’t touch the perfidies of big pharma and medical device manufacturers, who make bloody sure that they are protected from the free market. And thanks to yesterday’s Huffington Post, we’ve discovered just how stark the disparities are between hospitals: When a patient arrives at Bayonne Hospital Center in New Jersey requiring treatment for the respiratory ailment known as COPD, or chronic obstructive pulmonary disease, she faces an official price tag of $99,690. It brings bitter laughter to me when the Tea Baggers complain that Obama is bringing ‘socialism’ to medicine–the insurance companies, the healthcare networks, and the hospitals have made sure through their hyper-powerful lobbies that they are exempt from federal anti-trust laws and most business oversight. Medical care is already socialized–it’s just not socialized the way the 99% would want it to be. And since the patient has literally no idea what the charges are (and if insured won’t ever really know, since his insurance company undoubtedly has cut deals with providers on what the real price will be), there’s no way to protect oneself from bankruptcy. 1) We’re not going to fix the healthcare crisis without addressing costs. When an MRI costs $1080 in the US and $280 in France, we’re guaranteed the highest costs in the world without the offsetting value of better longevity. Time Magazine explained this earlier in the year (unfortunately, it’s behind their paywall). Hospital stays are Exhibit A for what has to be called hostage capitalism–you need a .50 pill and the hospital charges you $3, a hospital gown that goes for $8 retail is a $39 charge on your bill. Nobody has put cost controls in–the wingers derided any attempt to control prices as ‘death panels’, even though insurance companies make life-and-death decisions for people every day. Obama knew that cost controls were a non-starter. 2) A country that’s only creating low wage jobs for the 99% cannot afford a national healthcare system. Healthcare costs have been going up at double the rate of inflation for well over a decade, while median wages have actually declined over the past 30 years. And 58% of the jobs created after the 2008 crash are paying subsistence wages–if you price out what a low income person takes home from that Walmart job, the whole nut would get eaten by insurance premiums. Obamacare did not and could not fix the biggest cost centers in US medical care–the Repubs wouldn’t even vote for their own plan (ACA is the Heritage Foundation plan circulated in the 1990’s), and the Blue dogs would’ve jumped ship at any talk of limiting costs. Some 62% of bankruptcies in the US are caused by medical bills even among those people who have insurance. When Obamacare is fully implemented, we’ll still have people going bankrupt due to medical costs–it will just be a bit more spread out. Aren’t you tired of being a hostage? Are we all suffering from Stockholm syndrome, where we are trying to empathize with the politicians keeping the status quo? Where are the folks with pitchforks when you need them?